Recipes using grapes in the ingredients. 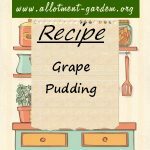 Recipe for Grape Pudding. A delicious desert that works well with most soft fruits. Enough for 4 to 6 people and lovely served with custard. 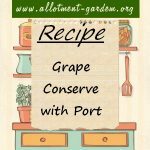 Recipe for Grape Conserve with Port. Makes about 2½ lbs( 1.125 kg) of conserve. It makes a lovely gift if you can bring yourself to give it away!